Vienna - Today’s Western Balkans Summit in Vienna is being accompanied by a series of side events that complement the political and economic issues discussed by the WB leaders and the initiators of the Berlin Process – last year’s host Germany, this year’s Austria and next year’s France, as well as the European Commission. Wednesday’s events included the Civil Society Forum which brought together Civil Society activists and some of the leaders gathered in Vienna, a full day of discussions by Civil Society Organisations (CSO) on how to use this opportunity and create a synergy between CSOs and regional governments and develop a partnership to speed up the EU accession process and there was even an evening football match between Football Club “EU” and Football Club “Future EU”, i.e. the Western Balkans in which the future EU members defeated the current ones by 4-2; surely a morale lifting result ahead of Thursday’s deliberations! On a more serious note, the European Fund or the Balkans (EFB) presented a study of its BiEPAG (Balkans in Europe Policy Advisory Group) policy brief on bilateral disputes in the Western Balkans – “Removing obstacles to EU accession”. 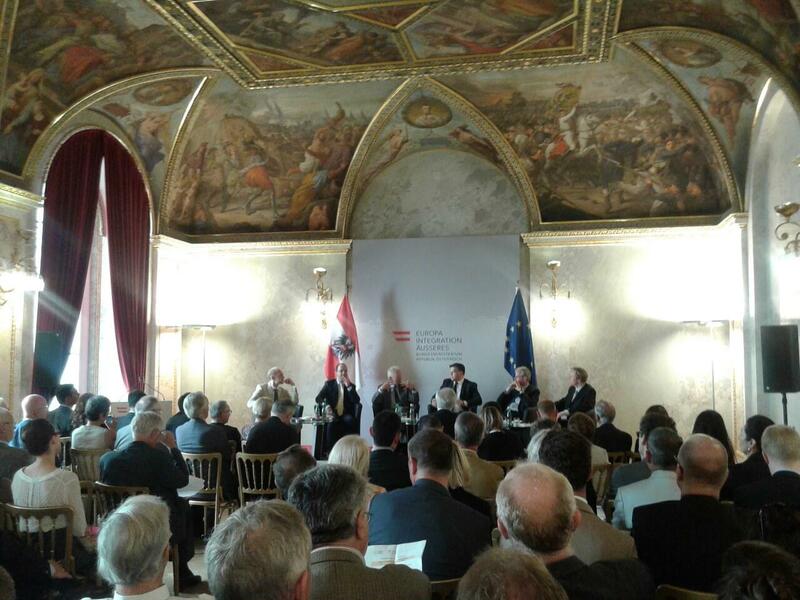 The presentation was co-organised by the Austrian Ministry for Europe, Integration and Foreign Affairs and was held in the great Marble hall of the Ministry with an impressive list of participants and an equally impressive and participatory audience. The full version of the Policy brief will be available shortly online but includes a set of key recommendations and even a toolbox for possible solutions for bilateral disputes. The study was presented by the Director of the Centre for SEE Studies of the University of Graz, Florian Bieber and the Executive Director of the EFB, Hedvig Morvai who were followed by a panel discussion including the Foreign Ministers of Albania and Bosnia Hercegovina, Ditmir Bushati and Igor Crnadak, the Director General for EU Neighbourhood and Enlargement, Christian Danielsson and the Political Director of the Austrian Federal Ministry for Europe, Integration and Foreign Affairs, Jan Kickert. The panel was moderated by the Visiting Scholar of Carnegie Europe, Stefan Lehne. The audience heard that a policy brief of this kind was a rare initiative, especially since it comes from the civil society and that it represents an excellent case of a search for common ground. Bilateral disputes are not a unique feature of the region, they are a problem shared with just about every corner of the world and include, of course, disputes between EU members themselves. This kind of a study could help the WB countries to find solutions which would benefit everyone. The EU was widely perceived as a possible facilitator in the process, especially by providing incentives for success in resolving the disputes. Where there is a will, there is a way and no matter how tough the issues appear to be, none of them is insoluble as such. They exist and will continue to exist, but to ignore them would be like trying to ignore an elephant in the room, and that isn’t an option which would benefit anyone, including the elephant. On the contrary, yesterday’s discussion pointed out that tackling the issues could result with a positive competition between the WB nations by trying to find the right solutions for a win-win resolution. Thursday, the official day of the Summit, will also have an important side event – the recording of a special edition of the regional television talk show “Okruzenje”, with the Prime Ministers of Albania and Serbia – Edi Rama and Aleksandar Vucic taking the centre stage together with the Secretary General of the RCC, Goran Svilanovic. The show will be aired on prime time throughout the region on Monday, August the 31st.